"This program has been very enriching and given me cutting-edge knowledge of leadership, strategy, and finance. The faculty has been highly inspiring and the teaching most captivating. Its worth any spend for someone who wants to add to or sharpen their current background to gain a distinct peer advantage — the Columbia advantage!" Columbia Business School’s Executive Program in Management is an intensive, eight week, multi-modular, general management and leadership program that is aimed at helping leaders scale new heights in their careers. Senior Executives begin in the fall by spending an immersion week at Columbia’s New York Campus. This is followed by an immersion week in Dubai where the focus shifts to entrepreneurial leadership and operations. Participants then return to the campus again in Spring 2018 for a week long immersion. Between these three immersions, executives receive faculty lectures through virtual delivery, continue work on designated personal and business projects and start putting their learning into action. There are also online programs as well as a virtual component to maintain the class connection and community, and share learning and reflections that reinforce bridging theory to practice. The Career Management sessions are integrated into the program to help participants think about how they can plan their careers strategically. For many this might mean a career transition; for others it might mean exploring larger roles with their existing employers. By exploring a wide variety of cutting edge management practices, through interaction with world renowned faculty, diverse peer interaction and action learning, participants emerge from the program stronger and more focused leaders, better equipped to take the next step in their leadership journey. Program Partner: Eruditus Executive Education is the program partner for Columbia’s Executive Program in Management. Prospective participants with questions on the program are encouraged to contact them for further information by email (epm_columbia@eruditus.com) or phone +91-22- 61623112 (India) or +971 44302011 (Dubai) or +65 6871 4030 (Singapore). 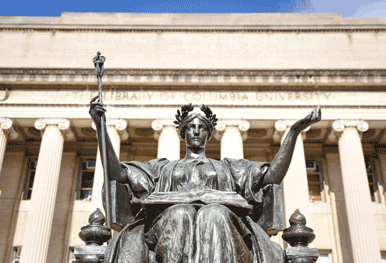 Access to expert Columbia faculty who are world renowned experts in their fields. Global knowledge and learning through faculty, cases and a diverse peer group. Flexible program structure which minimizes time away from work. Applied learning. Learn key concepts in an academic module, apply the same at your work place, and share learnings in the next module. Learn. Work. Learn. New York as a leadership laboratory. As the financial capital of the world, the city will be leveraged for some interesting learning experiences. Peer learning from a high quality group of co-participants who bring diverse experiences, cultures, nationalities and perspective to the classroom. The academic content of the program will be delivered in a mix of classroom sessions in the New York campus and virtual sessions globally. For a complete program schedule download the agenda (coming soon). The career management section of the Executive Program in Management is designed to help senior executives evaluate their longterm career direction, start thinking about how to accelerate their career progress and help them take concrete steps to achieve their career goals. This module of the program is designed and delivered by Caroline Ceniza-Levine. Caroline will leverage her rich experience of working with executives globally in helping them achieve their career goals, in bringing concrete, actionable career management advce to participants of the program. Personal Branding and Career "Insurance"
Participants will leave with a good sense of how to think strategically about their careers and also what steps to take today & tomorrow to achieve their goals. Please note: Participants are responsible for their own career paths, no job search facilitation will be provided. "I entered the program with 2 things in mind: 1. Get exposure on new topics on finance and strategy which I do not encounter in my current job. 2. Intellectually challenge myself by building network with experienced Professors and highly accomplished batch mates. It has been well balanced program from a time commitment perspective for working individuals, and at the same time it leaves you with enough 'food for thought' to take a topic to the next level." "Studying on an Ivy League campus in its centennial year leaves a significant impression on anyone. Walking through the halls of a library that holds treasures and sitting in classrooms that happen to be the most captured in cinema world over, are some of the memorable parts of the entire experience. "The classes on Negotiation left me thinking and Professor Todd Jick’s class on Managing Change drew a unanimous standing ovation from our batch! That I believe is a reflection of the knowledge and facilitation abilities some of our professors have for an experienced learner. All this set in the bustling business city of New York certainly made for many a reflective moment in the months that followed. "It was interesting to meet people from different geographies working across varied industries who stood to gain from this cultural melting pot. The cross functional work groups created allowed for us to leverage the knowledge and experience of others for the varied assignments both on campus and off." "EPM has been a wonderful experience. It has given me an insight into the latest thinking on management. It gives an overview of leadership, strategy and finance, which was very useful at this stage of my career. For a finance person like me, an insight into softer aspects like human behaviour and social interactions was really useful and noteworthy. "It was always a dream to attend a program at an Ivy League campus. CBS situated right in heart of NY, has been a great experience. On campus modules were exciting and provoked thinking. It was a pleasure to learn from world renowned faculty of CBS right in the campus. Vibrant campus with lot of history and surrounded by great institutions of learning, was a highlight of the EPM program." "I have always been involved in the businesses as a functional expert. It was my dream to be an alumni of Columbia Business School and improve my skill sets in Leadership and Strategy. When I read about the EPM Program, I knew that this was my calling. The Faculty has brought fresh and practical insights into managing the business situations and the Program has given me tremendous opportunity to expand my network of friends from all over the World." "After around 16 years of sales and marketing experience in the consumer goods sector, I was finding my learning experience plateauing a bit and felt the need to re-stimulate myself to the current thinking and developments in the business world. "The Executive Program in Management from Columbia Business School seemed a perfect choice which gave me an opportunity to immerse myself into a world class learning environment from a globally renowned faculty and a very experienced international peer group from different industries and functional areas. "The experience so far has been absolutely fabulous. With so many fantastic insights on different aspects of business, it has really re-energized my thinking to look at my current role from multiple lenses and be better prepared to take on future leadership roles." "Columbia EPM program has been an excellent experience, allowing me to gain and consolidate knowledge in management techniques thanks to the large experience of Columbia instructors and the collaboration with other executive students, with a special emphasis on the financial pillar. This is extremely important in order to understand better today’s global economy and the more and more complex trends, including capital markets and investments, asset management, M&As and strategic value. The program is designed in a very practical way, allowing time-constrained executives to practice with real examples and to share experiences from classmates. I’m sure this program will be instrumental in my career." "Undoubtedly one of the finest business schools worldwide with such a high pedigree, quality of teaching and a great campus in the financial world’s capital city - New York. The experience of EPM has been very fulfilling, enriching and has given me cutting edge knowledge of leadership, strategy and finance. The faculty has been highly inspiring and the teaching - most captivating. Its worth any spend for someone who wants to add to or sharpen their current backgrounds to gain a distinct peer advantage - the Columbia advantage!" "I've met with some great people and it was great to be back in a classroom. My intention to join the course was to assess where I am at my career and plan the next half of my career. The course has definitely helped me in this assessment. I think the course does not spoon feed you but introduces concepts which you may not be aware of and it’s up to you to then develop on that and apply it in your daily life. "I especially enjoyed the sessions focusing on softer skills like Negotiation skills, Managing Change, Strategy, the sessions where we understand our own personality and other personality types etc. The caliber of the professors was exceptional and it was clear that they have had experience in their respective fields. The interaction between the faculty and the students was also great." Professor Low is an experienced entrepreneur and a leading authority on entrepreneurship in independent, corporate and not-for-profit settings. As the founder of the Columbia Entrepreneurship Program, he has worked to make entrepreneurship a viable career option for MBA graduates. As the Co-Director of IE@Columbia, he has worked with faculty, students and staff across the University to spread innovation and entrepreneurship. He has also lead initiatives to improve business education in developing countries, particularly in Africa. Low consults to both small and large companies, family businesses and not-for-profits. He teaches executive seminars in the areas of entrepreneurship and innovation and makes frequent presentations to academic and industry groups. He has published widely in academic and practitioner journals and is a regular commentator in the media. He is an active advisor, board member and angel investor. Read more about Professor Murray Low. Our 152 full-time faculty members stay on the cutting edge of business and education by routinely partnering with businesses in New York and across the globe to test, refine, and put new ideas into practice. They capitalize on their extensive experience in the corporate world to develop course content that addresses the conditions and challenges of today’s business environment while anticipating tomorrow’s business needs. Working in our five main divisions – Accounting, Management, Marketing, Finance & Economics, and Decision, Risk, and Operations – or across divisions through our Cross-Disciplinary Areas in Competitive Strategy and Decision Making and Negotiations, faculty members give Columbia Business School students an extraordinary education that will prepare them to become exceptional leaders. To this exceptional group of full-time faculty members, we add in practitioners: adjunct professors who come to the School directly from the world of business (sometimes, just a short subway ride away). They apply real-life experiences to their teaching, creating precisely the right environment for students’ professional and personal growth. Our faculty assets don’t stop there. The Executives in Residence program brings senior executives to the School to hold regular one-on-one advising sessions with students, as well as to teach classes, participate in student-run conferences, or organize informal lunches for groups of students with common interests. Columbia Business School faculty members are world-renowned not only for generating new thinking in their fields but also for having a genuine impact on current business practices. Our professors routinely partner with businesses in New York and across the globe to test, refine, and implement new ideas for the ever-changing business landscape. Faculty members give you an insider’s view into their industry and the tools you’ll need to take those lessons into your chosen field. To succeed, leaders need to stay a step ahead of their competitors. That means looking for ideas in unexpected places, and absorbing them in original ways. EPM has a number of experiential class sessions to help participants create more organizational and professional value. Many of these sessions take advantage of our unique location, using New York City as a laboratory to study innovation, improvisation, and robust organizations. From Columbia University, we bring the finest relevant, cutting-edge research, so participants can engage promising ideas on improving performance before they become widely diffused. Below is just a sampling of what we do. Lessons for leadership can come from a variety of sources including the creative and performing arts. In this showcase session, we work with a live Jazz ensemble to introduce participants to the world of Jazz musicians. Using the Jazz experience as an organizing metaphor, participants consider the origins of Jazz – an art form born of conflict and crisis – and how lessons for leadership from a Jazz ensemble can help teams and organizations work better together. In this session, participants will explore the impact of human biology on leadership skills. We will introduce research showing how one’s levels of testosterone (a dominance hormone) and cortisol (a stress hormone) are related to leadership behaviors. Participants will have the opportunity to get tested for these biomarkers and how we will discuss how testosterone and cortisol levels can be modified. While it’s important for an organization to execute a strategy, there also must be space to be inventive. In the EPM classroom, we meet with thought leaders, such as Rita McGrath and Bill Duggan, to discuss strategic innovation. We also examine innovation up close, allowing participants to practice the leadership and interaction patterns that encourage new ideas. At Columbia, we see leadership as helping others to do better. To do that, though, one also has to lead oneself. So to help participants impact their organizations, we also help them impact themselves. We discuss social styles and the lifeline journey, which help participants reflect and prioritize what they’ve learned and allow them to better manage their time, priorities, and focus back at work. To apply to the program kindly send in the following materials to our program partner, Eruditus, at EPM_columbia@eruditus.com. Admitted participants will have to pay 10 percent of the fee within ten days of their admission to confirm their seat. Please note that if a candidate is admitted and accepts the admission, the application fee is adjusted with the program fee payable. The first module of the program takes place in the United States. For those applicants who need a visa to travel to the US, it is recommended you apply by the early application deadline to allow sufficient time for your visa processing formalities. For information on application deadlines, please download the program brochure.